Kruger was a tough, committed flanker who helped South Africa to their famous victory at the 1995 Rugby World Cup in South Africa. 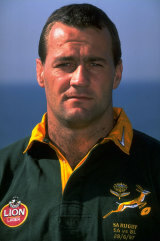 Having made his Test debut in 1993 against Argentina, Kruger was in prime form during the tournament and scored a controversial try in the semi-final victory over France in Durban. In the final he started alongside skipper Francois Pienaar and Mark Andrews in the back-row, beating the All Blacks to claim South Africa's first World Cup title. At club level he was a servant of Free State and Northern Transvaal, now Blue Bulls, and he retired after the 1999 World Cup following a series of knee injuries. In 2000 he was diagnosed with cancer after blacking out during a game and fought the disease for a number of years. In 2010 he died after losing his battle, aged 39.